David Zach wants to tell you! What does the future look like? Who wouldn’t want to know that? But futurist David Zachsays it’s not about predicting—it’s about paying attention to the world around us, noticing patterns and shifts and asking good questions. Zach wants to ask YOU a question: Is there an app for you? 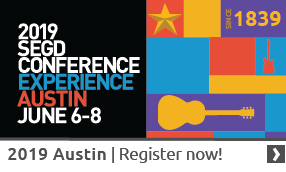 Explore the future with Zach at the 2015 SEGD Conference: Experience Chicago June 4-6! Read more about How's Your Future Looking? David Zach is one of the few professionally trained futurists on this planet, having earned a master’s degree in Studies of the Future from the University of Houston-Clear Lake. Of course that was way back in 1981, so it’s pretty much a history degree by now.